HST Trick- It’s Not Cheating, It’s Genius! 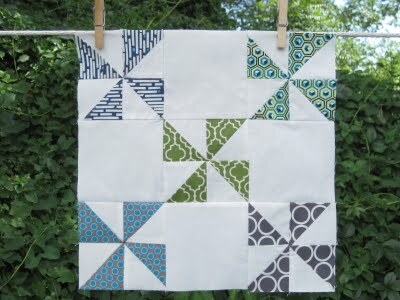 I’m having a blast with this skill builder sampler, but I must admit, DANG, this week’s pinwheel block was a killer! I’m not even a super newbie to HSTs (half square triangles), but for some reason this one literally took an entire evening…sad but true. Per directions, I did the old “draw a line corner to corner and sew on each side” trick for all 10 pairs…so much cutting, so much sewing, so much trimming! But somewhere around my third episode of Law & Order, as I’m slaving away, I remembered a sneaky little HST trick I learned from Jenny Doan over at Missouri Star Quilt Co, so I whipped up a quick little demo for you below. It’s so fast, you’ll almost feel like you’re cheating…ALMOST! Ok, first step, don’t cut zillions of tiny pieces! 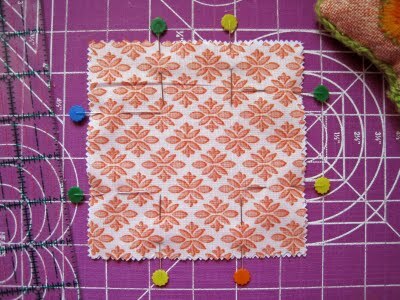 Start with 2 larger squares (I used 5″ charm squares, but you could also use 10″ layer cakes, or cut any size you wish! )- I also love high contrast colors for these. Next, lay one on top of the other, right sides together, and line up all of the corners. Place a pin or two in each side to prevent wonkiness (I skipped this step in my first attempt and the results were a little embarrassing…so yes, please, pin). Next, sew a 1/4″ seam around the entire unit, leaving no gap. Now you’re palms are probably sweating and you’re mind is screaming “NO! Wait! We’ve trapped this gorgeous fabric inside of a weird little pocket!”. Hold your horses!!! The fabric will escape soon! Now, carefully line your ruler up on two opposite corners, and cut. Repeat in the opposite direction. Now you have 4 cute little triangle pieces. Now we open, press, and…hey, wait!!! Those aren’t cute little triangles! They’re HALF SQUARE TRIANGLES! You just made 4 of them in like 90 seconds! And look what you can do with these little miracles! ANYTHING! Have you made a quilt using this method?? I’d love to see your designs! 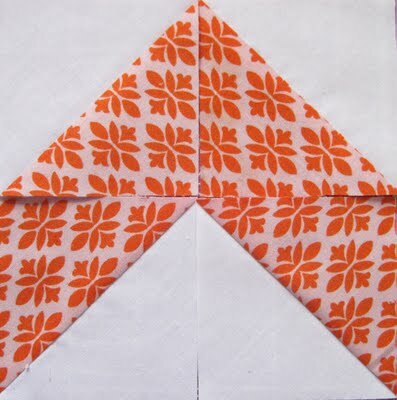 HST’s are so much fun- I want to do a zig-zag quilt next! I need a 2 1/2 unfinished square (HST) how would I figure out what size squares I need to start with – is there a formula I could use? They have updated the tutorial about pinwheels on the Missouri Star Quilt Co. They have a list of sizes and a formula you can use. The only one I can remember (because it is an easy one to remember) is 8″ square will make you a 10″ block. I just finished a quilt for charity (going to the east coast) and used a 10″ square and ended up with a 12 1/2″ block. I have searched on their site and can’t find it. Can you please tell me where I can find it? 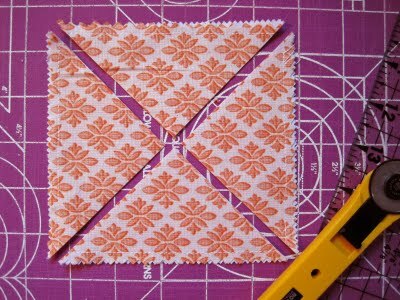 I cut 2 – 2 7/8″ squares, layer like Amy states here, and cut in half. That should give you 2 1/2″ squares. Hi Amy – what a great trick!!!!! Thanks so much for sharing. I’m going crazy here. I want a 4.5″ finished square (each one of Amy’s magic triangles) if I add 2″ to a 6 1/2″ square I am getting 4 3/8″ square, then I added 2 1/4″ to 6 1/2″ square and got 4 3/8″ square. what am I doing wrong. Try a 6 7/8 inch square. This should get you four 4.5 inch squares. Another possibility is to make it slightly larger and then trim. The calculation is more precise using decimals but I’ve converted to inches using fractions of eighths / quarters etc, for quilters using these measures. They will be approximated as a result! Finished square side length of 2 HSTs is the first measurement and the size of the starting squares given second. 6 3/8”+1/2” =6 7/8” squares to start! Good luck! Thanks! Saves me the trouble . I’m filing this. Oh Wow! wish I would have read this earlier this week, but I am definitely going to remember this one! Just pinned it for future reference. Thanks Amy! Fantastic–wish I had seen this sooner as well! Thank you! Love this tutorial….thank you. but I wonder about the bias edges of the half square. Did you have any problems joining the squares? 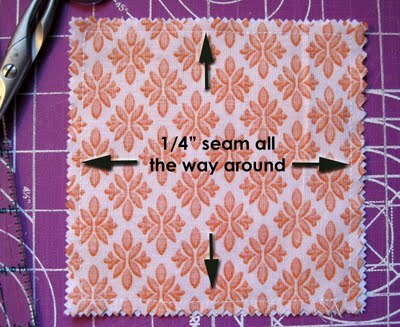 Starch is your best friend, as you start layering the squares, before pinning, even, straighten and starch each piece. Treat gently after cutting, and try to attach bias to SOG pieces where practical. If you have a walking foot on your machine, use it for the whole quilt, not just the binding. Thanks for sharing, Amy! HST are my current favourites so your little tutorial is a huge help! 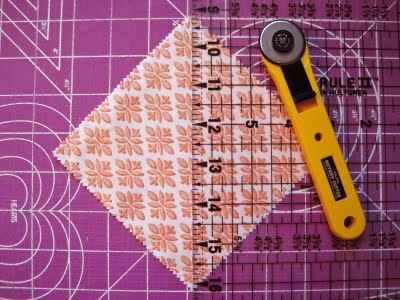 For those trying so hard to get the right size hst – make them larger, then just use your rulers with the 45 degree line on the diagonal seam and trim the squares to size. You may waste a little fabric, but it’s a lot less stress. Good luck! I do it this way so all my finished squares are exactly the same after trimming, resulting in a flat squared quilt. Even better is EIGHT at a time, and no bias edges! Similar idea, layer two squares. Draw a line from corner to corner twice, to make an X. Then sew 1/4 inch on either side of both lines so you have a triple X, He he. Then cut in quarters, top to bottom, then side to side. Cut along your drawn line. BAM! Eight hst, no bias edges. Wow! I just did this using 2 10″ squares. It’s slick as a whistle! Took me about 5 minutes to make 8 4.5″ HST. Thanks Linette Greene! any math trick to figure sizes or go back to a squared + b squared =c squared then fudge it?? Linette, That is genious!!! Thanks so much!!! Is there a formula for this method? That is much better as all those bias edges might be a problem. Do you press the seams to the darkest fabric? Depends on size of HST and how it will be worked into quilt. Avoiding “bulk” where points meet is always my concern. I press seams open when 4 HST diagonal points meet AND fan the points. But when only 1 or 2 HSTs meet, I will press toward dark fabric. With this shortcut, each half square triangle now has the seam on the straight of grain and a bias edge on all 4 sides, so press and handle them gently or your HST will end up with ruffly, stretched sides. Betty here,I have found your tutorials very easy to read,thanks ,I will try to make the triangles and play with the design as soon as I have moved house,thank you for your generosity of sharing. As a new wanna be great quilter, I found your “little trick” absolutely wonderful. 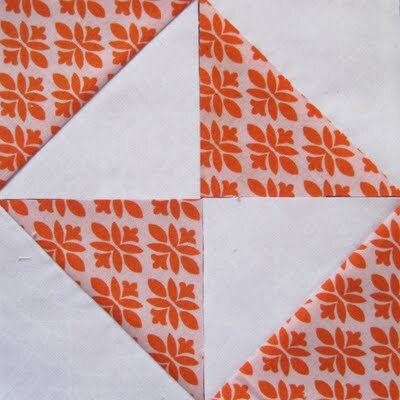 I wanted to attempt a quilt utilizing these type of triangles, this makes it look so much easier. Thanks for the idea! How would you then add sashing to the hst??????? Love this, must try. Very simple and easy to follow tutorial with great pictures and options. Will try the eight at a time also. LOVE IT! Jumped right up and tried it and am so happy. I am a beginner and am searching for all the hints I can get! I had a bash at making some last night…so quick and easy..thanks for the tips. Is there a formula for how big to make the original square to = what size finish? 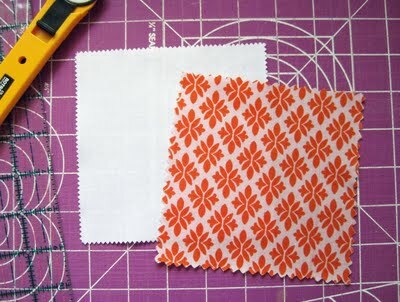 like, do I add 2 inches…for a 4″ HST, I would use 6″ square to start with or whatevver???? I use a grid pattern to create them! I learned this from “Quick Rotary Cutter Quilts”! I can crank out 20-30 of them with just a few straight stitches…dont forget the starch ladies! Amy, thank you so much for sharing this. I have been quilting for a very long time. I have not liked half square triangles because they can be boring. Now I can’t wait to give this a try. It seems so simple. 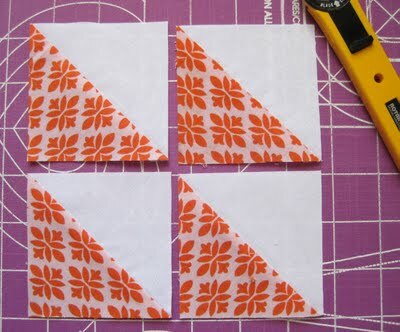 Hi Amy, Very cool quick way to make half-square triangles and it looks tempting, but is it harder to work with them since all the remaining raw edges are on the bias? Think its going to make it harder to sew them together, won’t they get stretchy and hard to work with? Amy, Thanks so much for your reply! I will certainly try this now! Beware. The bias edges are hard to work with. I gave up on this method after doing a few Doan patterns. This is a great way to cut, though I think these would actually be called quarter square triangles (the bias edges are on the outside of the resulting blocks). Half square triangles have the straight of grain edges on the outside. Since the placement of bias edges in a quilt block is often important, it helps me to think of the triangles in these 2 different ways. 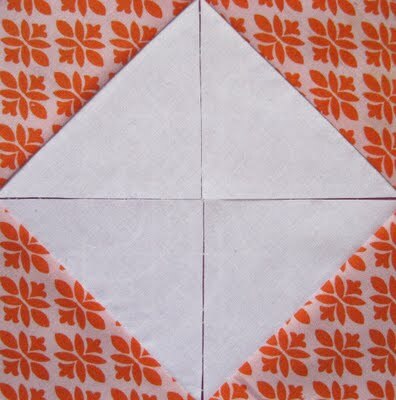 I have used this technique to make half square triangles. My suggestion: Once you have sewn the 1/4 inch seams, take it to the ironing board, and use Best Press (or another sizing spray) when you iron it. Now take it to the cutting board. The Best Press will help keep the bias edges from stretching. For those concerned about the Bias edges on this HST method, why not cut the original squares on the Bias, it would then give you finished HST squares on the straight-of-grain. I would personally leave starch in until all sides sewn. 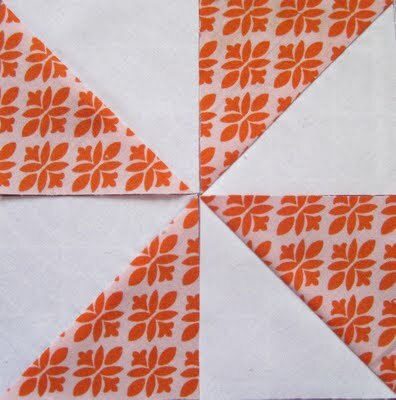 Im a beginner quilter and this made pin wheels seem like something I could actually do!! Thanks! Thanks for the tutorial – I didn’t realize I could get four small squares from two layer cake pieces! Do you have a pattern using these for a crib or twin size quilt? Just remember that your blocks will be on the bias, not on the grain line. I’mgoing to book mark your blog and keep checking ffor new details about once a week. Fantastic blog! Do yyou have any helpful hints for aspiring writers? Hi. I have made a few quilts using hst in a Chevron Design. Theyre really fun to make and you just keep adding on top you get the size you want. Initially I thought what a great idea. And it still may be that. One problem that I’ve had to become aware of when sewing half square triangles is always making sure that my finished block is stable along the outside edge. When you use this techiniques all the outside edges are bias edges. When you press the seam alliance open it is very likely to distort the fabrics on both sides. (especially if you are a newbie.) It can also be a problem if you need to handle the blocks a lot after sewing them. Sometimes easy isn’t the perfect outcome. If this works for you, great. Acknowledging the need to be careful with ALL bias edges might help folks use the techniques without distorting their final products. It may look easy but all those edges are bias – sorry, not for me. I’ve been wondering why this wouldn’t work! !❤ thank you! !